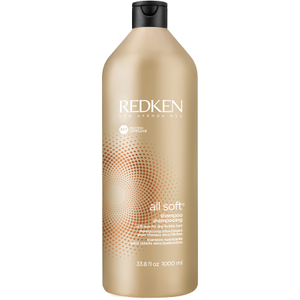 Redken All Soft Mega Shampoo gently cleanses while providing intense nourishment and softness to severely dry, medium to thick hair. This hydrating shampoo replenishes moisture, improves manageability and leaves hair with a soft and shiny finish. All Soft Mega Shampoo is infused with a Superfood Nutri-complex of Cactus Extract, Aloe Vera and Sacha Inchi Oil to hydrate, strengthen, and lock in moisture all day long. Apply to damp hair. Lather. Rinse. 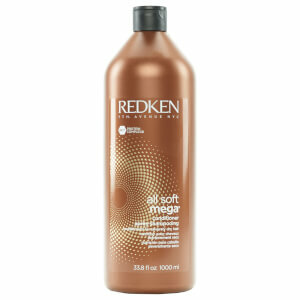 Follow with All Soft Mega Conditioner. Aqua / Water / Eau, Sodium Laureth Sulfate, Sodium Chloride, Cocamidopropyl Betaine, Dimethicone, Parfum / Fragrance, Sodium Benzoate, Amodimethicone, Carbomer, Glycerin, Guar Hydroxypropyltrimonium Chloride, Trideceth-10, Salicylic Acid, Hexylene Glycol, Glycol Distearate, Citric Acid, Mica, Sodium Cocoyl Amino Acids, Peg-100 Stearate, Phenoxyethanol, Steareth-6, Trideceth-3, Potassium Dimethicone Peg-7 Panthenyl Phosphate, Ci 77891 / Titanium Dioxide, Sodium Sarcosinate, Benzyl Alcohol, Propylene Glycol, Coumarin, Linalool, Peg-45m, Benzyl Benzoate, Hexyl Cinnamal, Limonene, Aloe Barbadensis Leaf Juice Powder, Arginine, Hydrolyzed Soy Protein, Plukenetia Volubilis Seed Oil, Caramel, Acetic Acid, Fumaric Acid, Hydrolyzed Vegetable Protein Pg-Propyl Silanetriol, Cereus Grandiflorus Flower Extract / Cactus Flower Extract, Glucose, Lactic Acid, Potassium Sorbate, Tetrasodium Edta, Bht, Tocopherol, Sodium Hydroxide.